For seven days, every February Sapporo is turned into a winter dreamland of crystal-like ice and white snow. The Sapporo Snow Festival, one of Japan’s largest winter events attracts nearly two million visitors who come to see the many snow and ice sculptures along Odori Park and the main street in Susukino. They include an array of intricate ice carvings as well as massive snow sculptures that are bigger than some of the city buildings. Snow sculptures are carved from snow brought down from the mountains surrounding the city. From these white blocks grow the pyramids of Egypt, high prehistoric animals, the famous sights of Japan such as Matsumoto Castle and Kyoto’s Golden Pavilion. 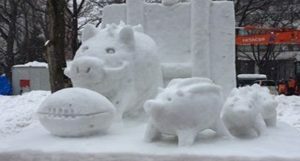 Just the beginning as we have also included the Susukino Ice Sculptures, the Asahikawa Snow Festival, and the Lake Shikotsu Ice Festival. There is still much more to see and enjoy over these five nights, not one, but two sake brewery visits, a day in the historic harbor city of Otaru, a music box making experience, Asahikawa Zoo to witness the Penguin Parade, Sunagawa Highway Oasis for the very best omiyage shopping under one roof, 2 fish markets, Jogai Fish Market and Nijo Market, and time for shopping and sightseeing in Hokkaido’s capital, Sapporo. Come along and celebrate the 7st Sapporo Snow Festival! Final payment due by December 3rd , 2019. Package is non-refundable after this date. 2/1/2020 – Depart Honolulu on Hawaiian Airlines flight 441 at 12:05 pm and arrives in Chitose at 5:00 pm, 2/2.